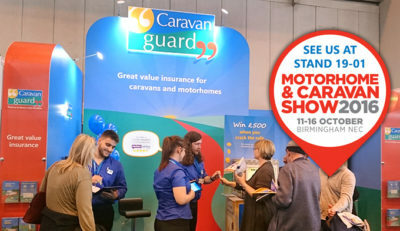 We’ll be at the UK’s biggest leisure vehicle show next week with our team of friendly caravan and motorhome insurance advisers and our Crack the Safe competition. The doors to the Motorhome and Caravan Show at the NEC in Birmingham open at 10am on October 11th and the show runs until the 16th, where you’ll be able to see the new-for-2017 caravans, motorhomes, campervans, trailer tents, and accessories, all under one roof. 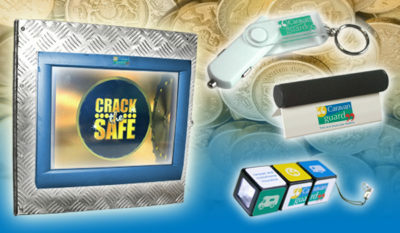 Caravan Guard will be exhibiting on stand 19-01 and visitors will be able to have a go at cracking our safe for a chance to win £500. All you have to do is drop on by and try to unlock the safe by entering your chosen three digit code. An Iceplane ice scraper – perfect for those winter mornings! If you’re looking to make some great savings on your motorhome or caravan insurance, as well as benefit from some excellent cover, then come and talk to us about our fantastic show offers. We’ll be offering a fantastic 20% discount* on new touring caravan insurance policies and £10 off* new motorhome insurance policies throughout the show. Plus you can find out more about our latest safety and security device insurance discounts for caravanners and motorhome owners. There are plenty of other free attractions taking place at the show and a host of celebrities will be visiting throughout the week. Journalist Matt Allwright will be at the show on Tuesday 11 October. TV architect and restoration expert George Clarke will make his show debut on Friday 14 October. TV presenter Julia Bradbury will also be welcoming guests on Friday 14 October. TV’s gardening expert David Domoney will be sharing his green-fingered tips for making the most of your garden on Saturday 15 October. The Guinness World Record LEGO brick caravan will be back at the show this year. It’s made from over 200,000 bricks and complete with electricity and running water. The caravan took more than 1,000 man hours to build and is a must-see at the show. *20% touring caravan insurance discount includes 10% new policy discount plus Caravan Guard’s ‘club’ discount. This discount applies to all online quotes automatically and can only be claimed once per policy term. 20% off and £10 off are available on new policies only. These offers are not available in conjunction with other offers and end 30/6/18. Minimum premiums apply and offers are subject to cover level and underwriting criteria. If no-one is able to guess the three-digit code correctly throughout the six day show, we’ll choose a winner for the £500 prize from all the entrants at random and announce who’s won by November 30th, 2016.